In August 2015, HEARsmart sponsored a Musicians for Hearing (M4H) charity gig. The event was held at the Gasometer Hotel in Melbourne and attracted a large crowd that came to see performances by local music industry luminaries Fraser A. Gorman, Alta and Lanks and Jim Lawrie. 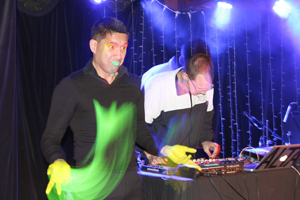 Donning fluorescent paint, the gig also featured Auslan interpreters (pictured right) from Auslan Stage Left who visually expressed the music and the vibe of the night for audience members with hearing loss. The gig raised more than $4,000 for All Ears Cambodia. This fantastic charity runs several audiology clinics across Cambodia, providing vital support for thousands of adults and children with hearing loss. M4H organised the gig to coincide with the 2015 Hearing Awareness Week. Siobhan McGinnity is one of the founders of the group – she is a trained audiologist and a musician and is a passionate advocate for healthy sound levels in live music. She’s so passionate she’s recently started her PhD on this very subject! The M4H gig was also proudly sponsored by Australian Hearing, The Deafness Foundation and Vicdeaf. To see more photos of the Musicians for Hearing Gig, go to the HEARsmart Facebook page.